So here's an ethical question for all you readers out there. 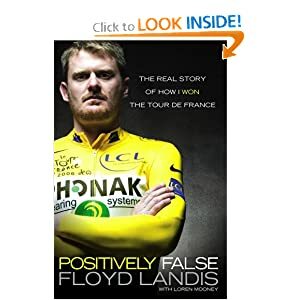 Should a book that was billed, advertised, and sold as an autobiography, and as a work of non-fiction, and subsequently been revealed as one long, hearty lie (by the author, no less!) be withdrawn from publication? Should the publisher offer a refund to all folks that bought the book (a la James Frey and A Million Little Pieces)? What about the author? Should he refund all the monies he made on the book advance? Yes? No? Or does the fact-checking fall into the hands of the publisher? Is it their fault that they published a whole lot o' crap? Should there be a stiffer punishment for authors that lie or for publishers that print false material? And lastly, for those of you that followed the whole Landis drama: What about the people that contributed to the Floyd Fairness Fund? Suckers? Or folks that simply believed the lie?